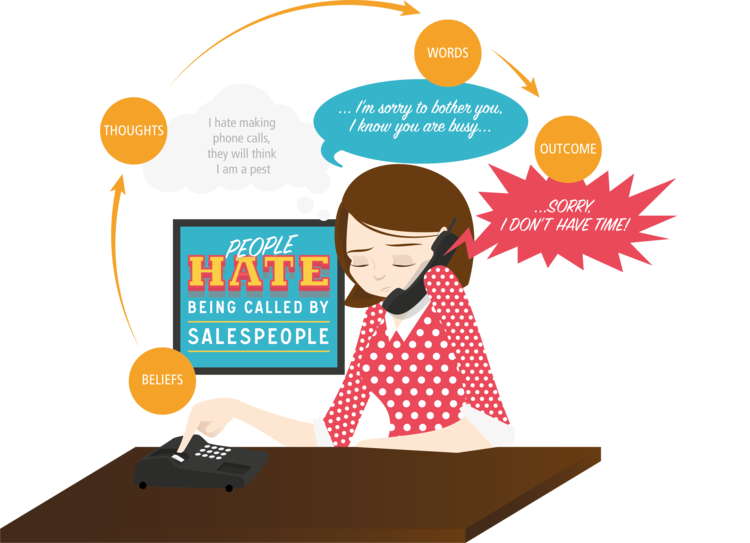 Are you sabotaging your sales conversations before they even happen? Just by thinking the wrong things you could be ruining your chances of sales success. In this blog we share one of the 6 mind-hacks of Top Performers, Expect Success. First, we look at harnessing the epic power of the mind so your brain is on your side and working with you to achieve your goals. Then, we give you three tips to re-frame your brain to expect success and influence more positive outcomes. By Jen Wagstaff, Director of CreativeMind and author of the Top Performer Journal; a powerful daily planner to help you develop great sales habits for success. If I said I was going to give you a thousand quid to walk down a path... would you do it? OK, you may have a few questions for me. Then, after you felt completely reassured that there was no catch; it was just a straight path (5 metres long, half a metre wide) in the local park and you only had to walk down it once to get the cash, you would probably think it is an absolute no-brainer. Your brain would be excited. You’d be thinking about how easy it was to get the money. You’d be feeling like the luckiest person in the world. And you’d walk confidently down the path and collect your prize. Now I’d like to take you to another place. Imagine we are at the top of the tallest skyscraper you have ever been to. You can see for hundreds of miles around you. The air is crisp and cool and eerily quiet. You can hear the faint buzz of traffic below you as tiny cars beep their horns and navigate the traffic. You can feel your heart pumping in your chest as you peer over the edge and look down at the ground hundreds of metres below. As you look over the edge you see a plank connecting this skyscraper with the next one. The plank is 5 metres long and half a metre wide. 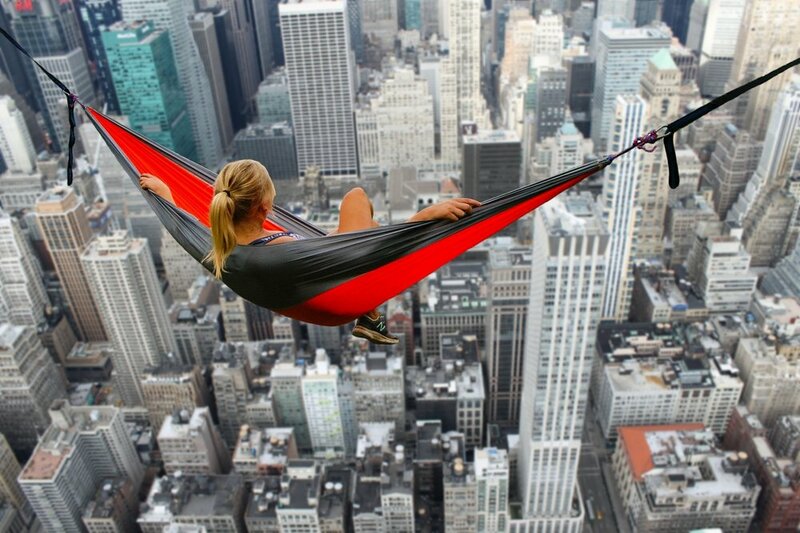 I reassure you there is no catch and there is no risk of death- there is a safety net to catch you if you fall. Again, I offer you a thousand quid to walk over the plank. I have asked this question to hundreds of salespeople in my training courses. Everyone says yes to scenario 1. Most people say no to scenario 2. The interesting thing is when I ask them why. In the park scenario they say things like “It’s easy! I can do it!”. When I ask them to show me how they would walk down the path they confidently stride across the training room, chest out with a big smile. Their thoughts are all about their confidence, certainty and success in achieving the task. Their body language mirrors this. They get to the other side and effortlessly collect their prize. In the skyscraper scenario they say things like “I can't do it. No way. It's too high." When I ask them to show me how they would cross the plank, they physically crumple, some even shakily getting on all fours and crawling across the training room floor. Their thoughts are all about failure. The risk. The fall. They feel sick. They shake, they sway, their head spins. And so they are more likely to fall. 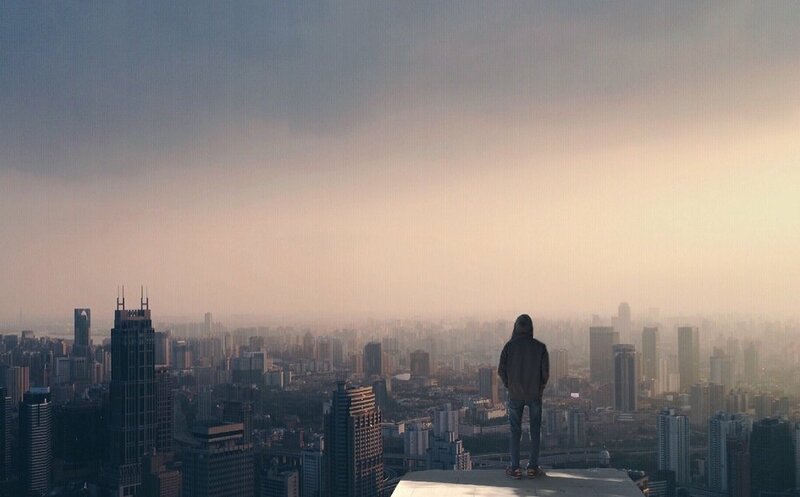 The even more interesting thing is that just thinking about the skyscraper scenario can cause real life physiological reactions, even in the safety of a ground floor training room. Some people genuinely feel their stomach lurch just thinking about the fall. Such is the power of the mind. How does your mindset impact your sales success? To download the free Top Performer mindset pack that accompanies this blog, click here. What you think becomes what you say, what you say becomes what happens. This is important in sales because a huge amount of our success is determined by our words. And our words are determined by our thoughts. Before you have a sales conversation, what are you thinking? The problem with this is that their dominant thought is focused on the negative… and by focusing on what you don’t want to happen, you are more likely to make that exact thing happen. Imagine for a second that communication is a spiral. You plant thoughts, ideas and suggestions in other people’s minds by the words you use and the way you say them. If you make a phone call thinking “I am a pest”, your dominant thought is that you are a pest. The tone of your voice becomes negative, the way your body sits becomes awkward and the words you say become rushed and apologetic. You expect to be rejected. And so you are more likely to be rejected. If you go into a presentation thinking “I know I will mess this up”, your dominant thought is that you will fail. Your body tenses as you prepare for failure. You can’t remember what you were going to say. You feel sick. You see everyone looking at you. Your body surges with adrenalin and you mind blank. You expect to fail. And so you are more likely to fail. If you go into a meeting thinking “they won’t pay the full rate”, your dominant thought is that you your offer is too expensive. You then plant this idea in their head. You talk about price early on. Your voice goes up nervously in question when you present the rate. You expect to discount. And so you are more likely to discount. How to re-frame your brain to expect success. Before you start a sales conversation, pay attention to your thoughts. What is your dominant thought (what you believe will happen)? Is your dominant thought helping or hindering a successful interaction? Is it about moving towards a positive outcome or avoiding a negative outcome? You can gain insight into your thoughts by looking at the words you use in your emails. Are you using negative words that lower your status and plant the seeds of doubt in your prospect's mind? Or do your emails expect the best possible outcome you desire? When I am mountain biking, I focus all my attention on the track ahead of me. As soon as I look at the tree I go into it. It is the same with sales communication. Before you enter a sales conversation focus all your attention on the outcome you want. Think about what you want to happen rather than what you don’t want to happen / what you want to avoid. The more you expect success, the more you are likely to see it. Because your thoughts and words are so linked, you can work backwards and influence your thoughts by changing the words you use on a daily basis. To find out how to do this, read our blog on the power of influential words. Your outcomes are dictated by your thoughts. Expect failure and don’t be surprised when it comes knocking. Expect success and see more opportunities and positive outcomes come your way. 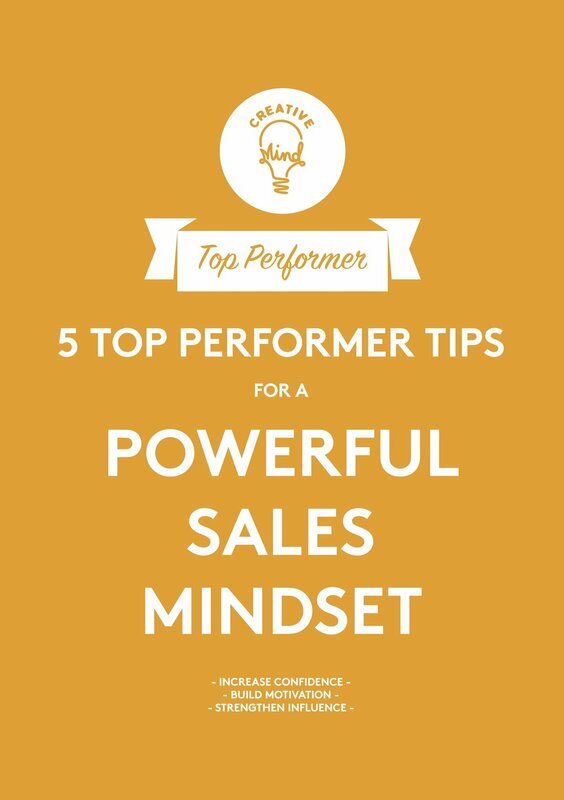 Read more about the 6 sales mind-hacks of Top Performers. HOW CAN I INSPIRE MY TEAM TO ADOPT A CONFIDENT SALES MINDSET? Got a sales team? Want some ready made training material to use in your next team meeting? Or order your very own Top Performer Journal today. "Is your brain on your side?" 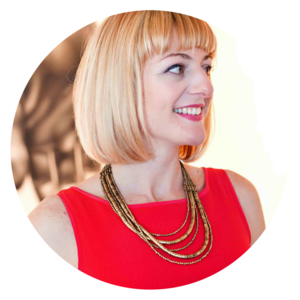 We write playful articles to help you stop winging it and start getting more quality clients. Sign-up to get them directly to your inbox. Copyright CreativeMind 2017. All Rights Reserved.